In front of the International Court in The Hague. 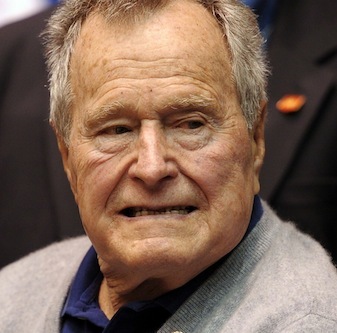 George Herbert Walker Bush is the supremely-qualified American-traitor who has been one of America’s leading traitors since he lied about being shot down in WWII, in order to enter politics, as an American war-hero: To divert the conviction of his father Prescott Bush who was convicted during WWII of fiscally aiding and abetting the Nazis. Those facts qualify the aging cripple, GWH Bush, to have more than just the legal standing necessary to face the global-courts for war crimes and crimes against humanity: Which coincidentally makes him equally culpable for his many treasons against the United States, the Constitution and the people of the United States… And I thought he was already dead and therefore beyond the reach of the ‘justice’ he has for so long evaded. Ironically this ‘Great News’ comes just at the time when Israel has decided to intensify their on-going role as the secretive-puppeteer behind the treasons they have been paying for in the Congress since 1963, via AIPAC, the internationally criminal foreign lobby which has chosen not to register their activities with the US government ­ which is so clearly against the law that it is beyond imagining. If you doubt this description of the scale of the crimes which all of Israel’s non-governmental-organizations’ fall into: Then just imagine what would happen if China or Russia had been caught buying the votes of 99% of the U.S. Congress ­ on pivotal-matters of potential global war with an act of nuclear war against Iran ­ that is what Israel is just ‘dying’ to start to do now? For those who do not know: It is against the law for foreign countries to give money, under any circumstances, to any member of the US government but especially to BUY influence with members of the United States Congress, the Courts or the Government. Israel however has gone further. Israel has demanded that members of the U.S. Congress sign loyalty oaths to Israel, over and above the ‘best interests of the USA,’ in order to qualify for their ‘campaign donations’ that are in themselves acts of treason and grounds for immediate removal from the congress, for each and every one of the weekly payments that the congressional traitors continue to reap. Beyond this technically damning evidence there have been numerous events throughout the ‘history’ of the “special-relationship’ with Israel that goes far beyond her individual traitorous actions. Israel has murdered hundreds of American servicemen and women over the years, and has never had to face any court, for any of her actions, beginning with the murder of JFK: Followed by the Israeli attack on the USS Liberty, (covered up by Admiral McCain, Bomb-Bomb’s traitorous father who was the commander of the American Fleet during the 67 war). That was followed by the murder of 241 unarmed US marines in Lebanon ­ during Regan’s watch, not to mention their crowning achievement of bringing down the towers on 911, with major assistance from GWH Bush himself - on behalf of his evil seed that had stolen the Oval Office on 12-12-2000. Just Google any of the uninvestigated Israeli events if you want to dispute the veracity of those deaths or the continuing damage that our failure to investigate has caused to the USA and the world. The laws against bribing the US Congress by foreign interests is very clear and it’s still there ­ all that the public has to do is to publicly-demand that it be brought to bear, with extreme prejudice, against every member of the congress that has been taking that money since 1963 ­ and who have all evaded arrest to this point in time. 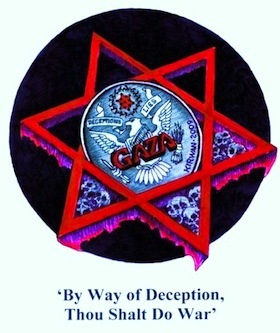 The motto of Mossad perfectly describes the personal actions of the entirely illegal Bush Clan from Prescott Bush, thru GHW Bush, on down to George W. Bush the lesser and it’s trying to continue through Jeb Bush, the Bush-clan imbecile. Yes this does go back that far because there is no statute of limitations for murder, especially political murders that have the potentiality of altering the course of nations ­ which all of these treasons have been very actively doing since the death of JFK in November of 1963. American’s of both sexes need to grow a pair and use the dust-laden-laws against treason to prosecute to the fullest extent of the law all the traitors throughout this government ­ beginning with the about to die grand-daddy of the New World Order in America: George Herbert Walker Bush, the Forty-First ‘president’ of the United States ­ No more!